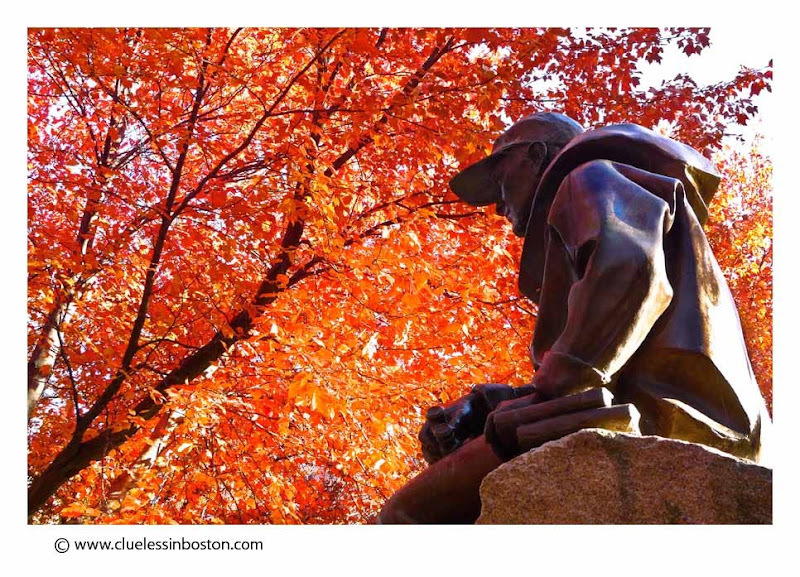 Bronze statue of Samuel Eliot Morrison located on the Commonwealth Avenue Mall. Morrison was a historian, sailor and two-time Pulitzer prize winning author. He researched and retraced the route Columbus took to the New World, and later documented Columbus' adventures and translated Columbus' log in his epic work, "Admiral of the Ocean Sea." Really like the composition and light in this one. Great shot. I like the read leaves behind the statue. Sam sure has a vivid outlook! Are those leaves current, or from the recent past? I agree with Kitty. Good show all around. Sooo gorgeous. I've read 2 anhologies of Mr. Morrison's works. The one that I remember the most vividly is his description of the trip thru the Strait of Magellan, linking his experience to the history of the strait. Probably time to re-read some of his work. He is an excellent, accessible historian. Sam picked an amazing place to look at some gorgeous Autumn colors! What a fiery background for Morrison! I'm clueless;) as well in L.A.! What a beautiful shot! You have chosen such an unusual angle, one that I would not have thought of. I love the gorgeous autumn colours too.